Flip a coin. If heads, for the next 5 rounds, Zeus's damage increases by 20. Don't put on weakness or resistance. The defending pokemon is now paralyzed for 2 rounds. 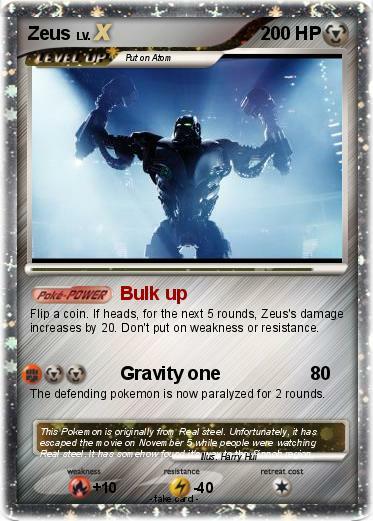 Comments : This Pokemon is originally from Real steel. Unfortunately, it has escaped the movie on November 5 while people were watching Real steel. It has somehow found it's way to the Sinnoh region.